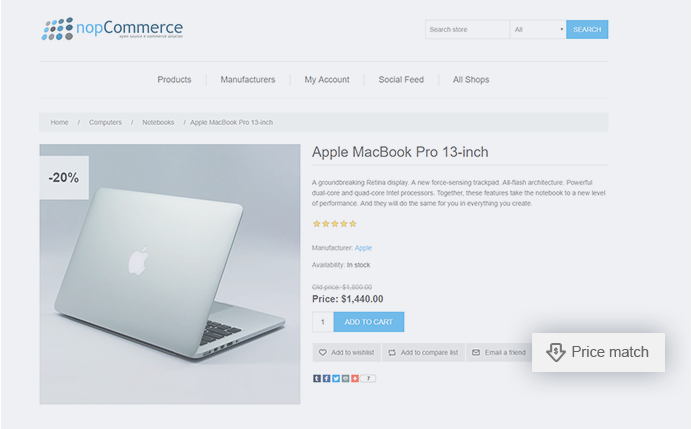 Stay one step ahead of the competitors with the new Price Match plugin for nopCommerce 4.0. With the plugin, you can provide your clients with the hottest discounts and the lower prices at just the right time. It allows your clients to give you a quote, which you can either accept or reject. 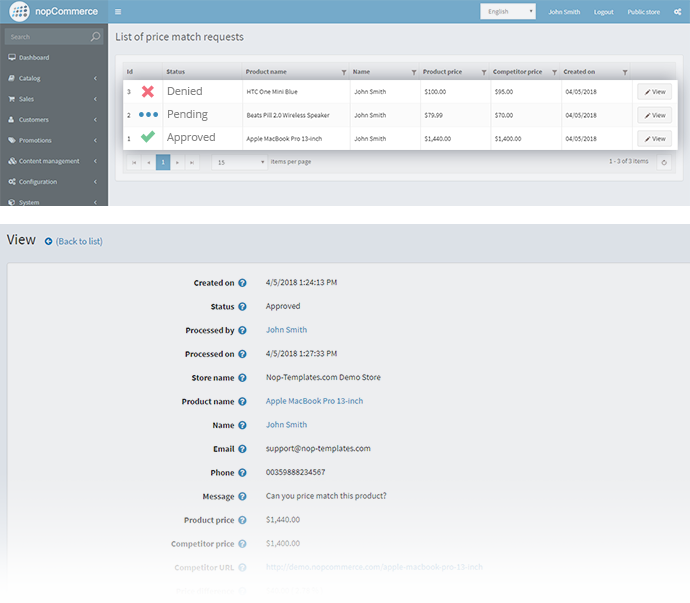 The Price Match plugin offers a flexible and an easy way to maximize your sales efforts. The plugin adds a "price match" button to the website product pages which allows customers to report lower price on the same product on other websites. 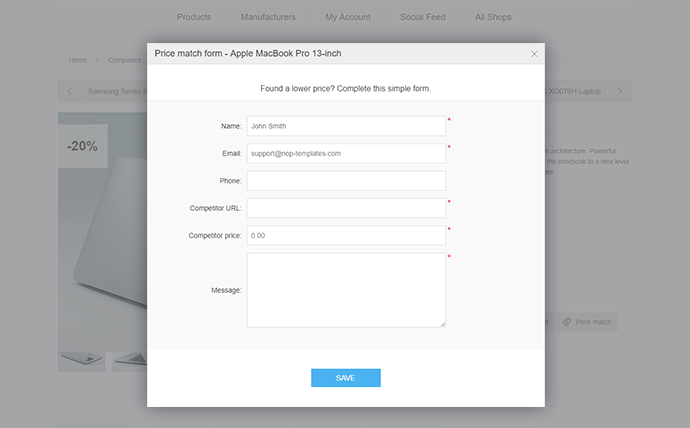 The "price match" button opens a request form that asks customers for their contact details, the competitors URL and the competitor price. In the administration of the plugin, there is a list of all requests with detailed information - your price, competitor price, customer information, request status (pending, approved, denied). 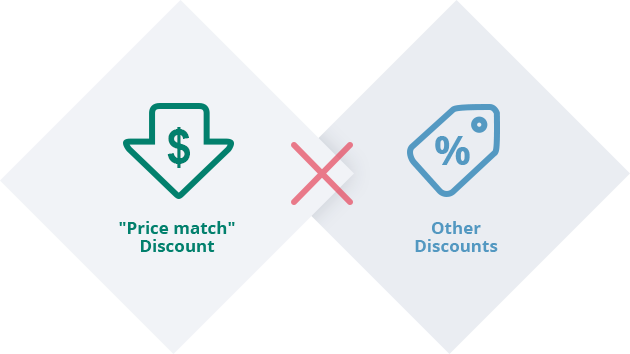 A discount is generated automatically based on the difference between your price and the competitor price. A store owner can approve a request manually or choose to have price requests auto-approval. For example, you can give discounts automatically to all clients that requested a price which is only 10% lower than the current one. You can enable the "price match" button not only for registered customers but also for guest users. The "price match" discount cannot be combined with other discounts. This will help you run hassle-free promotions on your online store especially if you have many promotions available at the same time. The plugin has a full vendor support. This means that a vendor can manage the "price match" requests for their products instead of the store owner. A notification by email option is available. 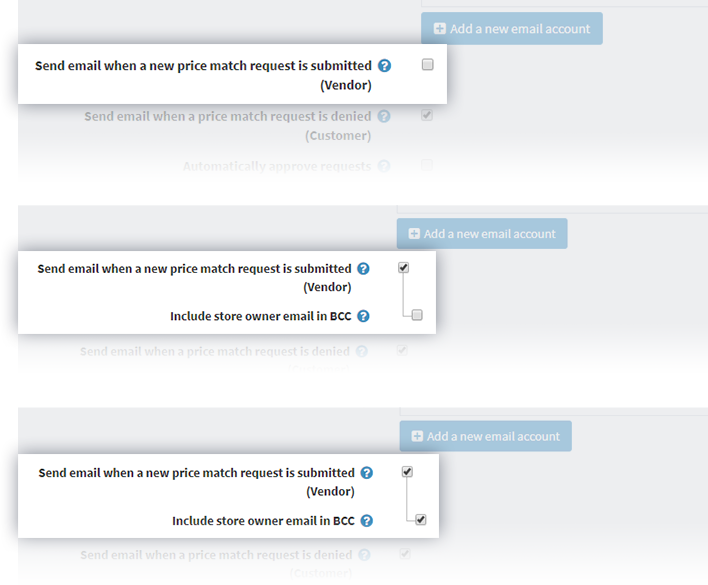 An email will be sent to the store owner only, to the vendor only, or to both when a "price match" request is received. The Price Match plugin is part of the Nop Ultimate Plugin Collection which includes a total of 29 premium nopCommerce plugins.